Hiring! Who wants to work at the sweetest shop in town?? Yes, you heard correctly, The Candy Store is hiring! So skip on over and bring us your resume, then jump online and fill out the application. We look forward to hearing from you and maybe adding you to our sweet staff! Want to know the hottest ticket in town tonight?? It's to Bon Appetit Ottawa! Every year this amazing event raises money for local charities and celebrates the best in Ottawa's food community. What's even better, is that this year's event has a Going Green Initiative to help make this year's event a very green affair! Taking inspiration from all things green, The Candy Store will be at this year's event with a fresh and bright table filled with green and blue delights! From malt balls to bon bons and beautiful little cupcakes from The Cupcake Lounge, we're in for a sparkling night. Please come say hello to us and sample a treat or two! Didn't get a ticket in time to this sold-out event? Not to worry, we'll be setting up our display in the store later this week so that we can share the spring-like palette. We will, of course, also make sure to snap some photos in between nibbles! Celebrate the return of spring with us every Saturday this month as The Cupcake Lounge brings us a selection of seasonal favourites and also something special for Mom! As always, cupcakes can be ordered in advance (to ensure you get your sweet fix!) by emailing, calling or coming by the store. All cupcakes, including pre-orders, are available as of 11am every Saturday! 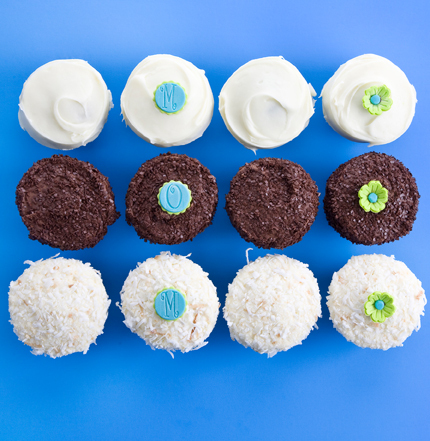 In addition to single cupcakes, a Mother's Day Box will be available featuring all three flavours. All Mother's Day Boxes are available by half or full dozen and only through pre-order. Happy first day of the month! We're basking in the sun and planning our Saturdays. This month sees the return of some very popular favourites (red velvet, anyone??) as well as a nod to St. Patrick's Day with Bailey's on March 12! Please note, we will not have cupcakes on March 19th - even The Cupcake Lounge needs a break now and then! Want more Candy Store in your life? Connect with us on Facebook and Twitter! We're so excited to share this news: due to the overwhelming demand for cupcakes on Valentine's Day, the sweetest day of the year, The Cupcake Lounge, will be making their Sweethearts Box AND making it available for pick up at The Candy Store! Check out their site for the photo of the adorable cupcakes all boxed and ready to give to your sweet heart. The box will be available in full dozens or half dozens by pre-order only. All pre-orders must be placed and paid for before Saturday, February 12 at 3pm. Pre-orders can be made by coming in, calling or sending us an email. Half dozens will include a mix of the above flavours, as determined by The Cupcake Lounge. Get in touch with us today and take the guess work out of what to get for your sweetie! Forget California dreamin' on such a winter's day...We can't think of anything better on a snowy day than day dreaming about sweet, moist, decadent cupcakes! Thankfully, The Cupcake Lounge has sent along this month's menu to tantalize us and fuel our cupcake-filled dreams. As always, we recommend pre-ordering if you know you'd like more than a few cupcakes - we try our hardest, but running out is always a strong possibility. All pre-orders can be made by calling, coming in, or sending us an email and we'll put your precious treats on hold! There's also some very exciting cupcake-related news coming down the pipeline soon, but we can't spill the beans yet - we'll tell you as soon as we can! !